The United Nations General Assembly established in 1972 the World Environment Day to create global awareness about environmental problems around the world. The celebration is observed every 5th day of June with a specific theme and a host country. This year, Angola is hosting the occasion and the theme is “fight against the illegal trade in wildlife”. I have already posted my very few photos of wildlife so I’m using instead a photo I took of this waterfall at the Morikami Japanese Garden and Museum. I also decided to add an old Native American saying, which was supposedly spoken by Chief Seattle, although no one really knows its origins. 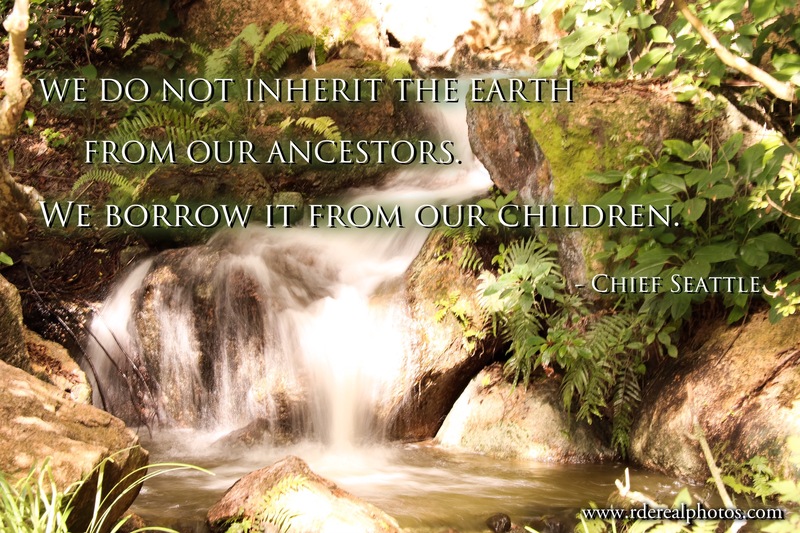 Anyway, regardless of who spoke this saying the message remains the same that we are all responsible for the preservation of our environment and the protection of every life on it. In my part of the world, there is a huge debate about climate change with a significant number of people denying it and insisting it’s just a hoax. I believe this is a cause that is not negotiable and shouldn’t even be debated upon and politicized. Regardless of our political views, nature in itself must be protected and preserved for the very survival of humanity and its future generations.